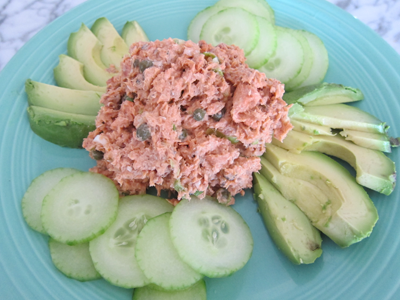 Post-Workout Eats: Lemon/Caper Sockeye Salmon Salad | eat. live. paleo. Sunday is our big workout day. And for our post-workout lunch we’ve recently taken to eating canned fish. David likes red sockeye salmon with bone and skin included, while I opt for wild albacore tuna, which is lighter. 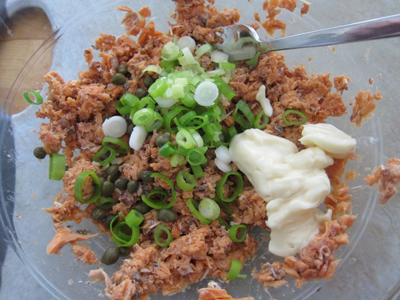 For David’s sockeye salmon salad, I use a 7.5 oz can of wild caught Alaskan red sockeye salmon (Whole Foods brand). To make the salad: Drain the can, and put salmon in a glass bowl. With a fork, mix the salmon well, making sure that the bones and skin are blended into the meat (basically, mush well). 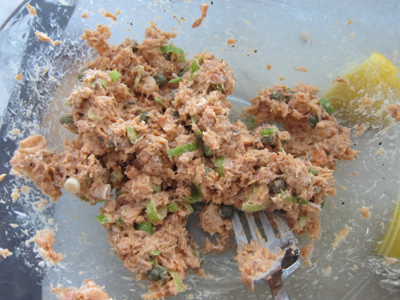 Add: a half handful of capers, one scallion stalk, finely chopped, a tablespoon of mayonnaise, and the juice of 1/2 lemon. Mix well, and season with salt and pepper to taste. Serve with salad greens, or for extra protein — as in David’s case — some sliced avocado and cucumbers. The salad is simple, delicious, and a great way to get a boost of protein as well as calcium and good fats!